This week in 3-2-1 Comics! : Death of the Family concludes in Batman 17! 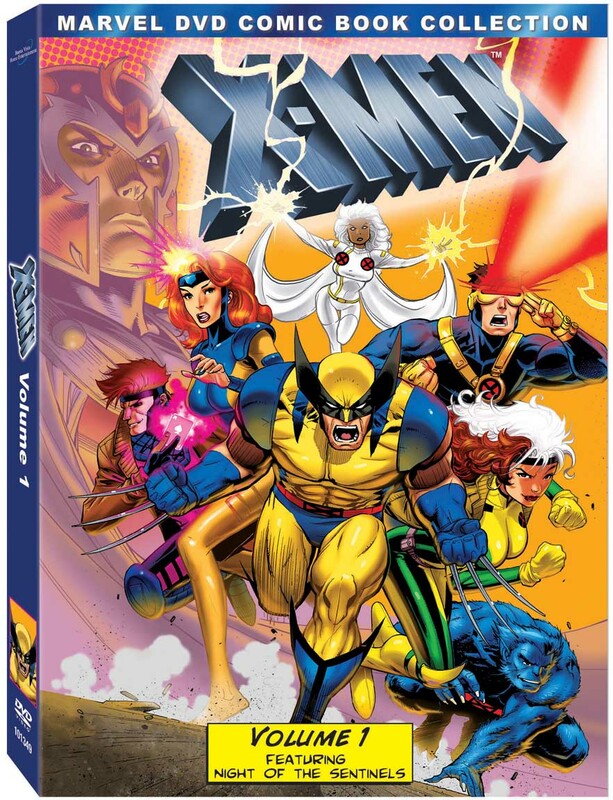 A new Uncanny X-Men book launches with X-Face… I mean Cyclops! And Star Wars gives us what we want: THE FETT!…kind of. 3-2-1 Comics! My cousin Zach said it simply: “No Simone = no Batgirl (this month).” Gail Simone’s Batgirl has been hit or miss, but it’s true – the knowledge that she wasn’t involved with this issue instantly made it feel less important. The basic plot of Batgirl #17 is that Babs and Commissioner Gordon are hunting down the remnants of Joker’s thugs after the events of “Death of the Family,” while James Jr. has a plan of his own. Ray Fawkes is guest writing for two or three issues (DC’s website is frustratingly inaccurate about this.) Batgirl has been traditionally narrated from Barbara’s perspective, which Fawkes subverts to a seemingly third person narration. There’s a twist to this, but it isn’t as clever as it is intended. Daniel Sampere sufficiently pencils the book, and while I like the sleek look he gives Barbara in costume, I am not as thrilled with some of his character work (Someone has GOT to do something about Barbara Sr. to differentiate her look from Babs.) All in all this was a dull issue that will probably lead to a dull arc. It especially holds less weight knowing that Simone will be coming back shortly. This is it. 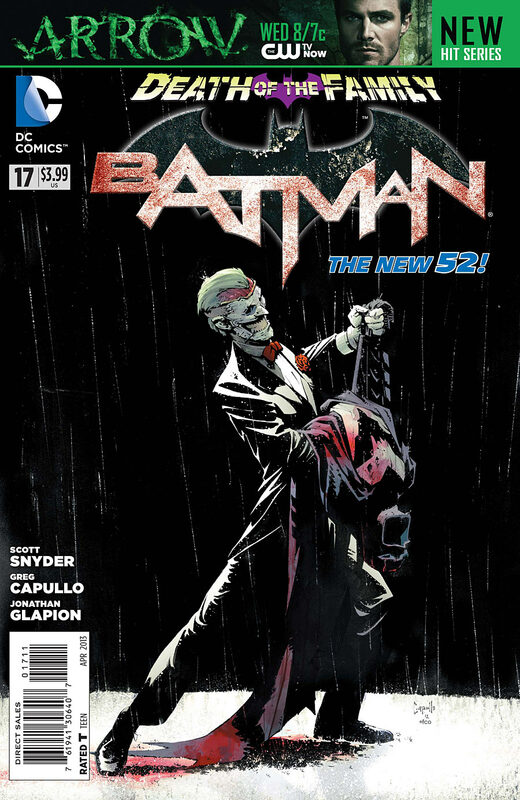 Scott Snyder’s “Death of the Family” arc reaches its conclusion this week in Batman #17. The Joker has Batman and all of his family gathered for a very special meal, meaning we finally get to see what’s under those serving dishes of Joker’s. The Dark Knight has his final showdown with the Clown Prince of Crime and things may or may not ever be the same. As far as explosive grand finales go the ending to this arc unfortunately doesn’t live up to the hype. Though Snyder’s end may not have as much of a bite, it is still a great read, focusing on the essential truths of Batman and Joker’s relationship. It’s clear that Greg Capullo takes a lot of pleasure in drawing the rotting face on the equally joyful and hateful Joker. Sometimes he skimps on the details when it comes to members of the family, but makes up for it in a Batman that goes from stoic to frightened . The end of “Death of the Family” rings true with Snyder’s take on Gotham as a force working against Batman, something that Snyder has maintained since “The Black Mirror” in Detective Comics. A lot of critics are giving Batman #17 a perfect score, and as much as I really want to I just can’t justify it. It’s definitely great, but not perfection. I really admire what Pete Tomasi is doing with Batman and Robin, a title that might get lost in the mix or mistaken as “overkill.” Tomasi has a deep respect for these characters and the creators that have been molding their worlds, like Grant Morrison and Scott Snyder. 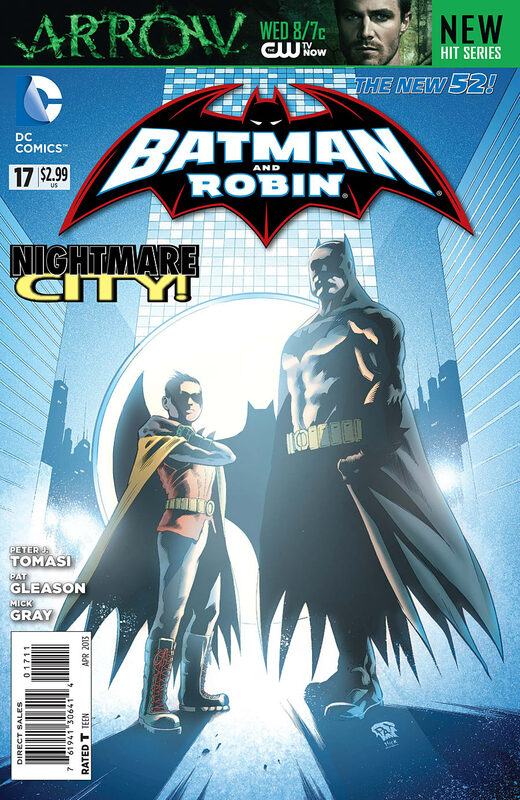 Batman and Robin #17‘s story delves into the dreams/nightmares of our two heroes, as well as Alfred. Tomasi once again shows the complex dual-nature character of Damian as well as how Alfred truly feels about The Joker, a man that has caused so much pain for the ones he loves. We have taken many glimpses into Batman’s psyche before, so that portion of the story isn’t really unexplored territory. Tomasi uses the dream narrative well, placing emphasis on metaphors and symbolism that are steeped in Batman history. And who better to illustrate these ideas than Tomasi’s partner in crime, Patrick Gleason? Gleason gets one more chance to draw his gruesome “Death of the Family” Joker, and in one instance as a wonderful literary metaphor. My favorite page of this issue has got to be the full page layout Gleason draws of Damian finding Batman in the iconic scene after the bat crashed through the window. This particular bat is larger than life, wrapping itself around Bruce, who beckons Damian to join him. Loved it. This was a standalone issue that didn’t necessarily add much, but dream storytelling provides unique insight into characters when they are completely unguarded. A lot of fans are super excited about this Star Wars book, which takes us back to the classic universe that so many of us grew up on. And while I agree with this sentiment and was very intrigued to see Leia in charge of a secret task force, the second installment is kind of a bore. We get introduced to members of Leia’s team, as well as Colonel Bircher, Darth Vader’s replacement on his Star Destroyer. Han and Chewie are being chased by Boba Fett, but its a plot point that sadly gets brushed aside quickly. Carlos D’anda’s art is one of the only redeeming qualities of the book. His space battles look like freeze frames of the films, and his character work definitely channels the vibe of A New Hope, before Luke’s face got wripped up by that Wampa/car crash. The problem with many Star Wars books is their exhausting reliance on superfluous explanation of how things in Star Wars work. 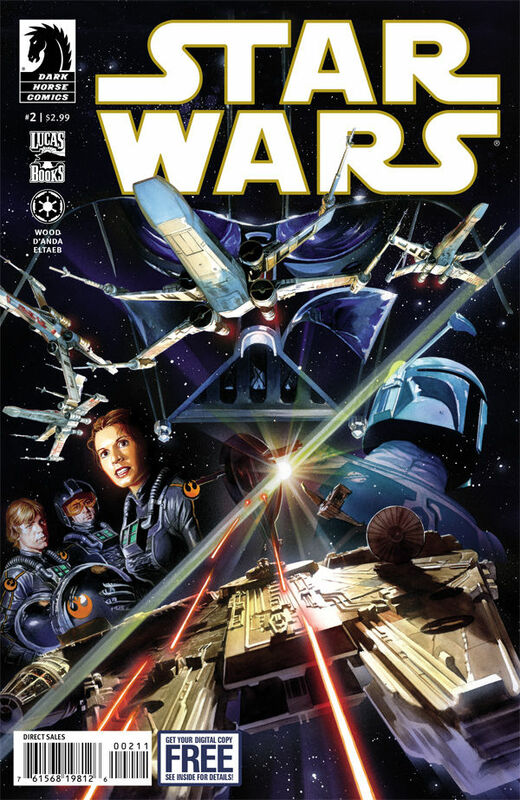 Its an argument that can be made for novels, but like Star Wars films, comics are a visual medium, and they need to let the visual half shoulder some of the storytelling. Brian Wood needs to move this series along a little quicker, and make it far less wordy. 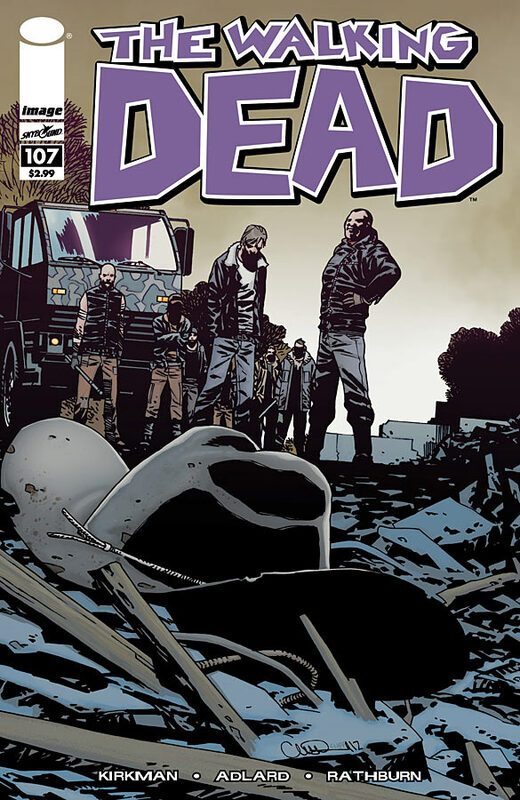 After a pretty gripping issue last month, The Walking Dead takes a dip in terms of quality. Negan brags to Rick “wait till I see what I did to your boy,” the two fight, it gets broken up, then we find out that Negan was bluffing. Back at the home camp, Rick keeps up the facade that he is bowing down to Negan, while he uses Carl’s knowledge of Negan’s campt o plan their next move. The issue was a lot of talking, which the series does normally well, but none of it felt like it was going anywhere. Eventually we will see Rick and Co. take on Negan’s forces and some of our heroes will fall, then on to the next conflict. Charlie Adlard makes the fight between Rick and Negan pretty entertaining, I especially liked the part where Rick (in subconscious irony) bit him. Things are getting pretty formulaic here, Mr. Kirkman. We are over 100 issues in and things are definitely feeling stiff, I’d like to see some new ground covered – perhaps an underground government bunker? Just a thought. 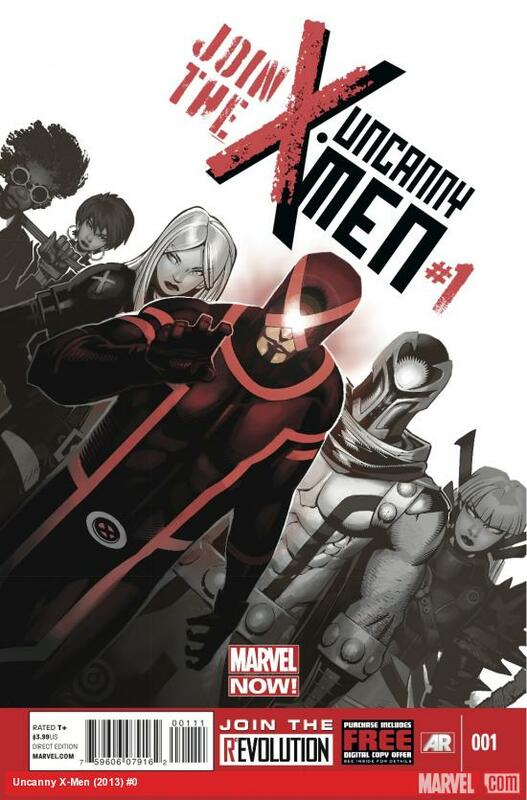 This week sees the launch of Brian Michael Bendis’ second X-Men book: Uncanny X-Men. 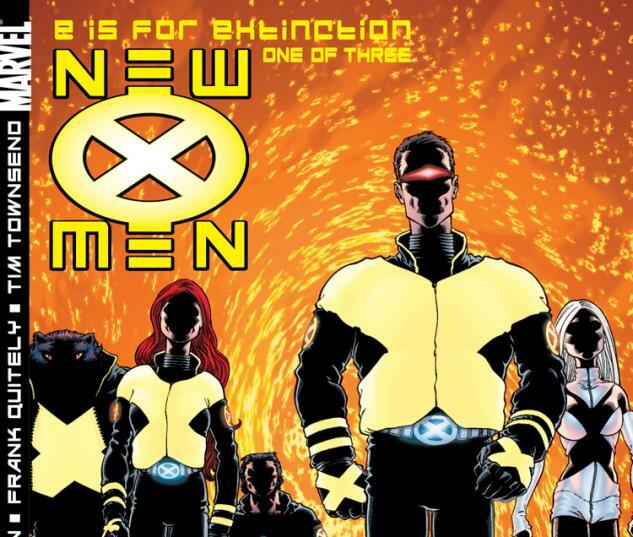 Bendis’ All New X-Men splits time between Wolverine’s camp with a little room for Cyclops on the side – this book seems to promise Scott Summers a little more face time. The first issue shows us that Cyclops’ team is steadily growing stronger, but has a traitor in their midst. The book opens said traitor coming to SHIELD, asking for their help to take Summers down. I like how Bendis clearly presents his mission statement for both X-books right away, giving each series a unique purpose. Chris Bachalo is on pencils, debuting some new outfits, including Cyclop’s “X-face mask” and a very Boba Fett-looking Magneto (which I admittedly really liked.) Bachalo recently drew Marvel’s mutants in Jason Aaron’s Wolverine and the X-Men, and similarly to that book, he gives us plenty of mutant action in some powerful double-page spreads. I really dig the style he brings to the characters, accompanied by heavy inks that gives the book its own feel. Bendis puts out a solid first issue, and I will be particularly interested to see where this traitor goes from here. 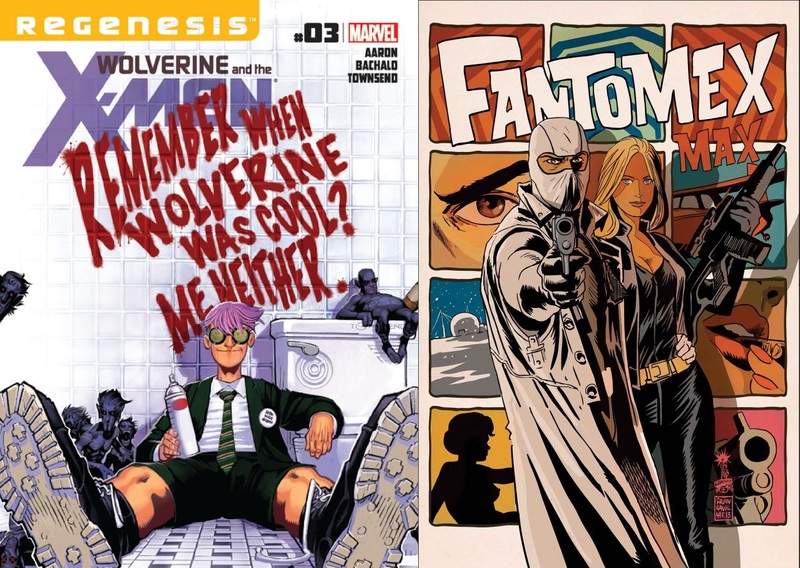 After my sad sack (but justified) reaction to the latest Star Wars news, lets lighten the mood with this week’s 3-2-1 Comics! Cheers! All eyes are on Sholly Fisch as the regular backup writer for Action Comics takes center stage as lead writer for Action Comics Annual #1. 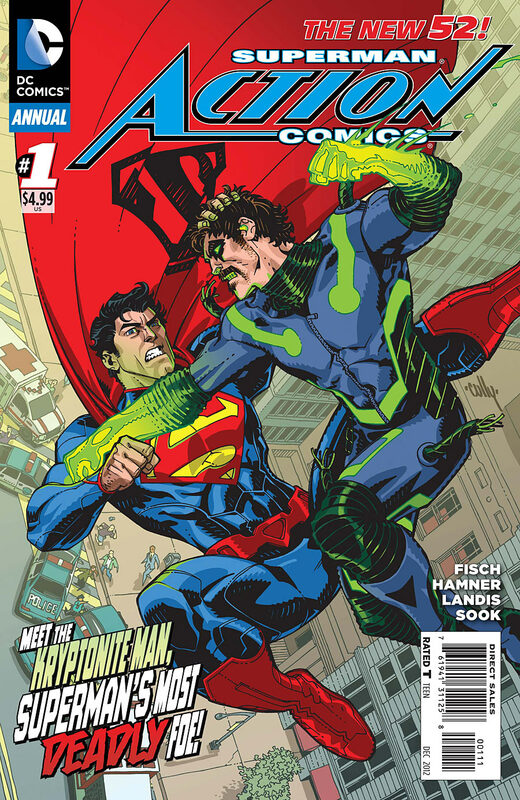 Annuals are typically self-contained stories, and while this issue falls under that category, Fisch once again chooses to expand upon a minor detail from Grant Morrison’s main story, this time with a full issue dedicated to a throwaway line of dialogue from Action Comics #1. The story was pretty mediocre, but Cully Hamner’s pencil work was the delicious chocolate frosting on a bland piece of vanilla cake. DC needs to put Hamner on one of their books as a regular artist, STAT. Throughout this issue he has a consistent animated style that’s a lot of fun to see. 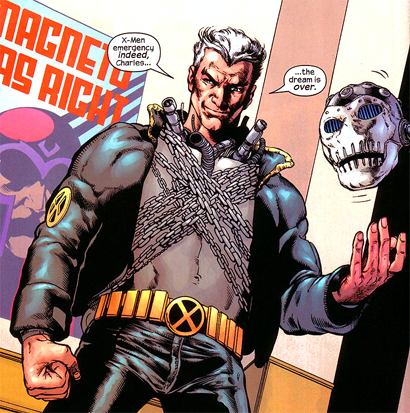 A lot of hype was given to Chronicle screenwriter Max Landis’ backup feature on the Atomic Skull, drawn by Ryan Sook. It’s a completely visual story, with no dialogue whatsoever. Frankly I wasn’t impressed. Aquaman is always a great read if for no other reason than that Geoff Johns is so single-minded in his presentation of the story. The title is so strong because he doesn’t focus his energy on New 52 shakeups (like he does in Justice League), and instead gives the attention t the characters’ relationships (like he does in Green Lantern.) You would think that would be a no-brainer, if you hadn’t been following much of the New 52 that is. #13 sees the end of the second arc “The Others,” where Aquaman and his gang confront Black Manta and his mysterious employer. This issue also marks the conclusion of Ivan Reis and Joe Prado’s run on the series, as they will be moving on to Justice League in December. The artistic duo brilliantly emphasized a regal and fierce nature of Arthur Curry that is one of the reasons why the book has been so successful. 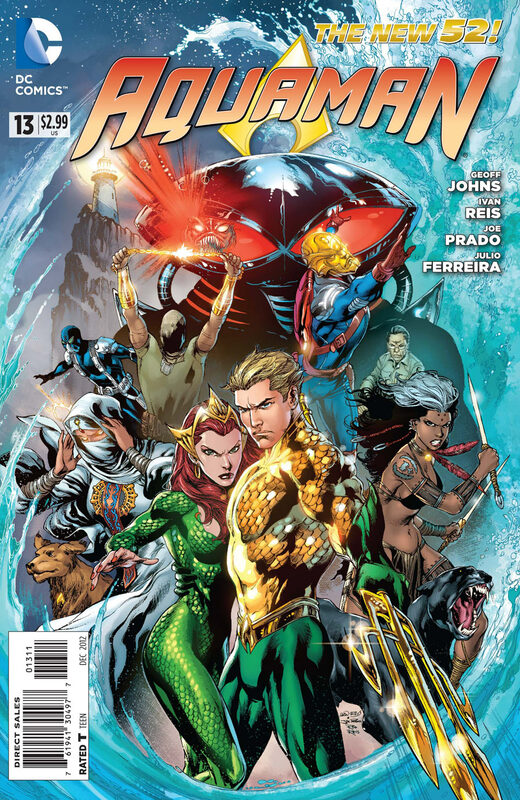 This issue’s conclusion wasn’t completely satisfying however, with some lingering questions that will probably be answered in the Justice League crossover “Throne of Atlantis;” which will surely to continue solidifying Aquaman’s status as a serious contender. 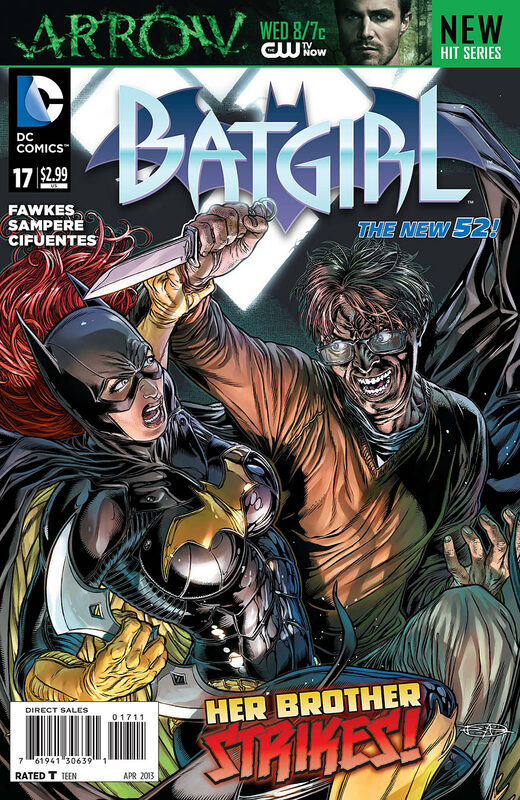 In Batgirl Annual #1 Gail Simone crafts an interesting tale involving three women who have all seen their fair share of trauma in their lives and are stronger because of it. Long story short Catwoman is hired to bust the female Talon (from #9) out of jail and Batgirl is pursuing them both. My main reaction to this issue was that Gail Simone writes an excellent Catwoman and should be doing so on a routine basis. 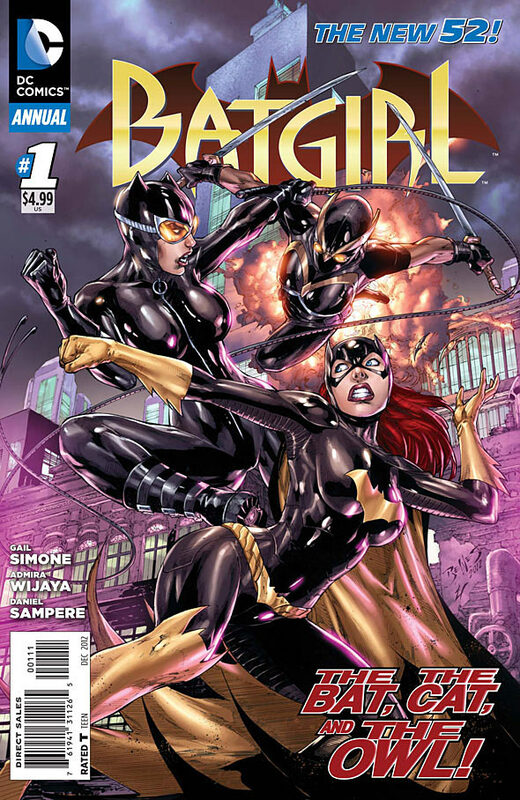 The artwork by Admira Wijaya is a refreshing shift for Batgirl, with a unique style that batter supports Simone’s scripting than the standard penciller. Unfortunately Wijaya only covers 2/3 of the book, leaving Daniel Sampere to pick up the slack at the end – not very well I might add. Batgirl Annual #1 is a more cohesive read than past Batgirl issues, and I hope that it continues on this track. 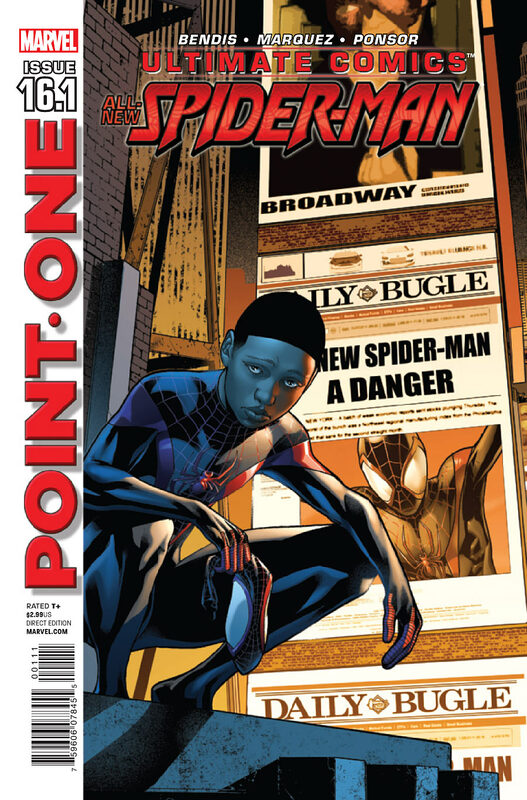 I always find myself doing a double take when I see that a Marvel book is labeled “Point One;” isn’t that from 2011? I digress. Brian Michael Bendis takes Ultimate Comics Spider-Man #16.1 to show the aftermath of Miles’ fight with his Uncle Aaron, the Prowler. The story doesn’t really feature our new Spider-Man, but rather follows Betty Brant putting the pieces together of the new Spider-Man’s identity. Artist David Marquez takes us on the tour of Betty Brant’s journalistic quest, no complaints about him. There’s a double page spread of Betty searching an apartment that was laid out like a blueprint that I was quit fond of. This was a good enough issue, but feels expendable. The dramatic tension of the story could have been better served over the course of several issues, instead of being introduced and ended all in the same breath. 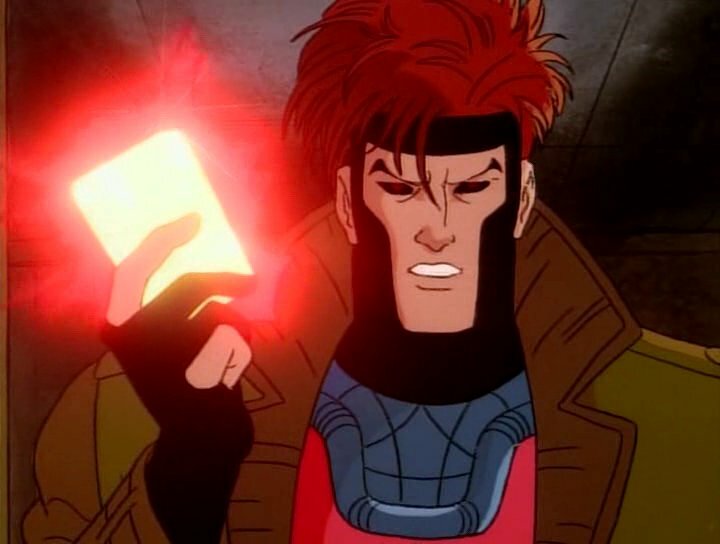 Wolverine and the X-Men reminds me of the great episodes of Buffy The Vampire Slayer, with a strange marriage of humor and drama that works surprisingly well. The more comedic exchanges of this issue come from Kitty Pryde’s interview process for a new teacher at the Jean Grey school. 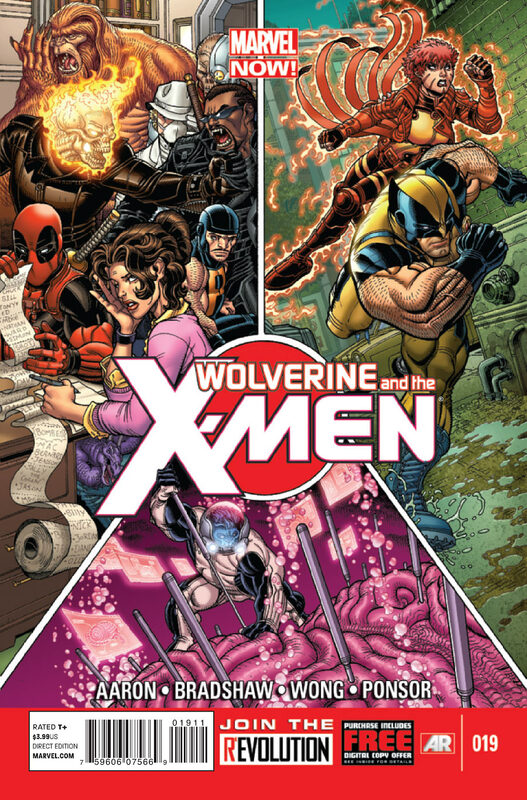 The rest deals with Wolverine, Beast and Rachel Grey searching for those responsible for shooting everyone’s favorite Brood student, Broo. Nick Bradshaw deftly renders the vastly differently styled characters very well, and plays up the humor of Kitty Pryde’s dilemma. This was a great read, though I will say that Beast and Wolverine’s hunt for Broo’s attacker, while justified, seemed a little forced. Beast was calling up Tony Stark, Reed Richards and Peter Parker (in a bow tie?) all for their expertise for this ONE student? I don’t know, maybe I’m just cynical. Grant Morrison’s comic series about an ex-cop on the run hallucinating (or maybe not) a flying blue horse has reached its halfway mark. Despite what many critics have been saying, I find Happy! to be on the lower end of the Morrison scale of awesomeness. The second issue deals with Nick Sax coming to terms with the fact that there may actually be a cartoon horse talking to him, and playing that to his advantage. 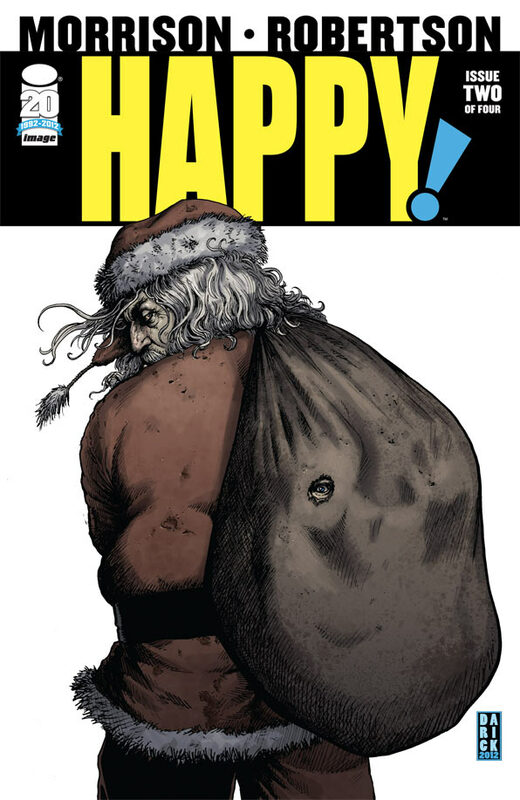 Besides Happy himself, the tale is pretty grounded in the world of drugs and crime, covered in the grimy and violent pencils of Darrick Robertson. Perhaps my disappointment is due to my expectation of a more fanciful adventure than this. Either way, the pace is moving way too slow for a four issue series. At the end of the issue, Happy is trying to convince Nick to help him save a little girl, but Nick is still questioning if Happy is real or not. There seems to be a lot to get done in two issues Mr. Morrison.